These tartan flashes are made from Poly Viscose material (the same material we use for our Casual and Semi Traditional kilts). The garters are elastic with metal clips and are adjustable, so one size fits all. They are sold as a pair. To view all of the tartan options available, click on the "Select Your Tartan" button directly above this text. Price is perfect for this item. Good construction that appears to be very durable. 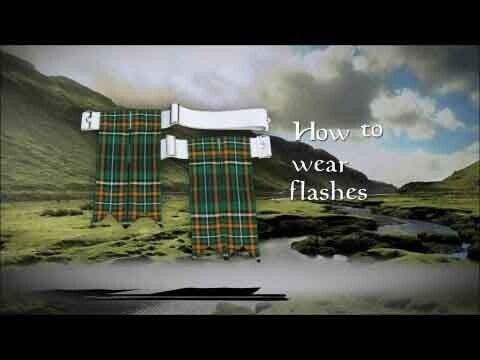 Flashes are adjustable elastic garters that help to keep up your kilt hose. Pull up the hose all the way and wrap the garters around your leg, just above the widest part of your calf. Attach the metal clips on either end of the garter and fold the hose back down over top of the elastic. Roughly 2.5" to 3.5" of the flashes should be visible from under the turned over hose top. 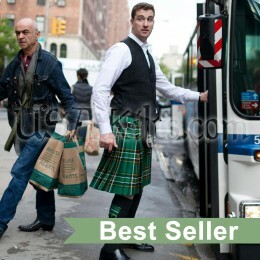 These are a custom item and usually ship within 48 hours.